Description: UPS-friendly 1x1 train-compatible loaders with support for Bob's faster belts. This mod introduces miniloaders, 1x1 entities that efficiently transfer a full belt worth of items into and out of containers, including train cargo wagons, with minimal UPS impact. They use no Lua when running, keeping your factory's UPS healthy. or put them in your bus as single-belt lane rebalancers. Green and purple belts from Bob's Logistics are fully supported. Miniloaders require stack inserter research, are relatively expensive to build, and consume approximately the power of two fully-upgraded stack inserters. 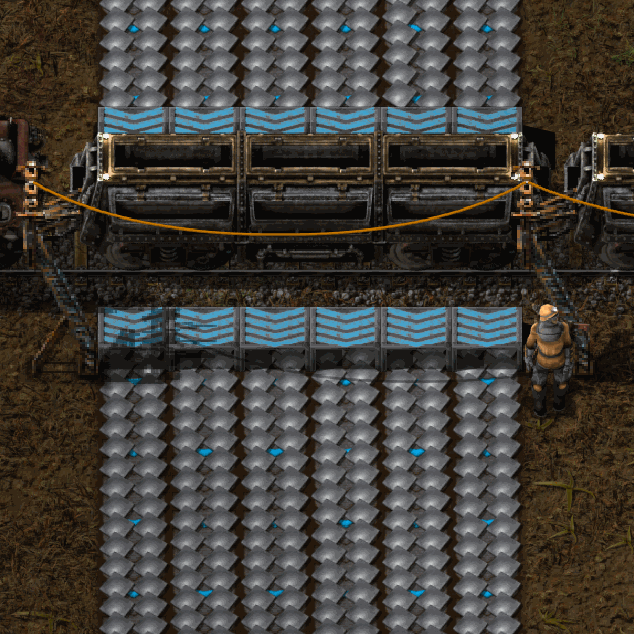 Each miniloader hides a set of very fast invisible inserters, one for each lane of the belt. Lua scripting adjusts pickup and drop points accordingly when the direction of the miniloader is changed. Since item movement is handled by inserters, there is no on_tick handler, no Lua impact on UPS, and miniloaders will benefit from any future improvements to belt and inserter performance made by Wube in the Factorio core. Versions of miniloaders with and without filtering are available once the appropriate technology has been researched. As you would expect, to build a miniloader capable of filtering, you must use filter inserters as ingredients. Note that filter miniloaders behave like filter inserters, and not like vanilla loaders: if no filters are set then no items will be moved. You must set at least one filter. The power usage UI counts each miniloader multiple times, since it shows the power used by the inserters, not the miniloaders themselves. Miniloaders cannot be fast-replaced due to the invisible entities blocking placement of the new entity. Miniloader arrows don't always appear correctly in blueprints. Ultimate Belts support is in BETA state. 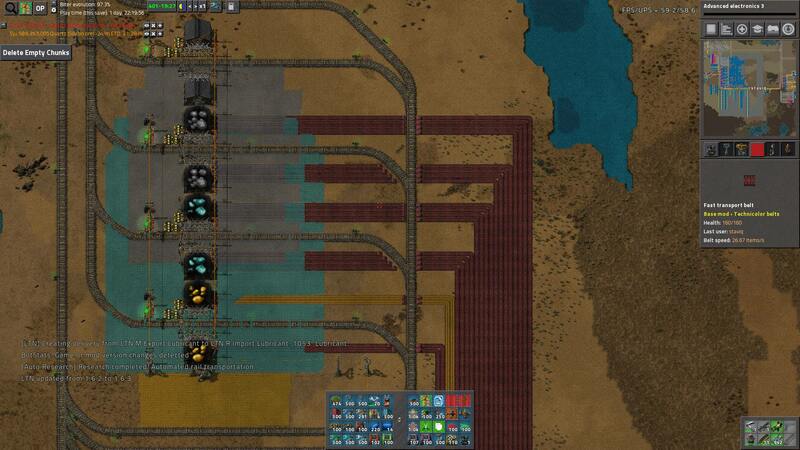 Factorio core engine limitations restrict inserters pulling from belts to 60 items/second, or 4.5x yellow belt speed. Further, loader entities are restricted to 120 items/second. Miniloaders at "Ultra fast" and faster speeds use vanilla loader entities in addition to inserters, giving a max throughput of ~180 items/second when interacting with chests and other containers. They will not give full throughput when loading cargo wagons, and circuit control is disabled since vanilla loaders cannot be circuit controlled. Arch666Angel --- for the original 2x1 loader graphics, cut down to 1x1 with permission in versions through 1.5.x. Articulating --- for the original Loader Snapping. Optera --- for Loader Redux's revised and improved loader snapping code, adapted here for Miniloaders with permission. Last edited by Therax on Wed Oct 31, 2018 9:48 pm, edited 40 times in total. However, I only saw the note about instant deconstruction leaving behind invisible entities after I'd already done that - now I have a bunch of flashing "no power" icons floating around my base, preventing me from building anything else in their locations. Is there a console command we can use to delete them? Even if it breaks working miniloaders, that's fine - I can always replace those. Also, I'd really love the ability to enable/disable miniloaders via the circuit network. They'd be perfect for loading and unloading my trains, but I'm using LTN, and all of my stations have circuit-controlled inserters for precise request amounts. thegroundbelowme wrote: I love this mod! thegroundbelowme wrote: Also, I'd really love the ability to enable/disable miniloaders via the circuit network. They'd be perfect for loading and unloading my trains, but I'm using LTN, and all of my stations have circuit-controlled inserters for precise request amounts. I'll look into it. Circuit integration for new entities is unexplored ground for me. For now I'd suggest using circuit control on the belts just before the miniloaders. It will only be approximate, so I hope that's sufficient? Do I need to do something special to make it load train? I placed it next to cargo car on automated train but nothing goes into cargo wagon. It has power and one next to it that loads chest works without problem. I figured it out. It won't do chest to train, it needs chest, loader, belt, loader, train to work. Additional question - any idea why game lists energy consumption for standard speed one at 4.8MW ? It shows actual consumption of about 100kW on my 6 (3 working I think). orzelek wrote: I figured it out. It won't do chest to train, it needs chest, loader, belt, loader, train to work. Yes, it is a loader, and goes container to belt, or belt to container. It's possible to do belt to belt due to some weirdness in the implementation, but not container to container. 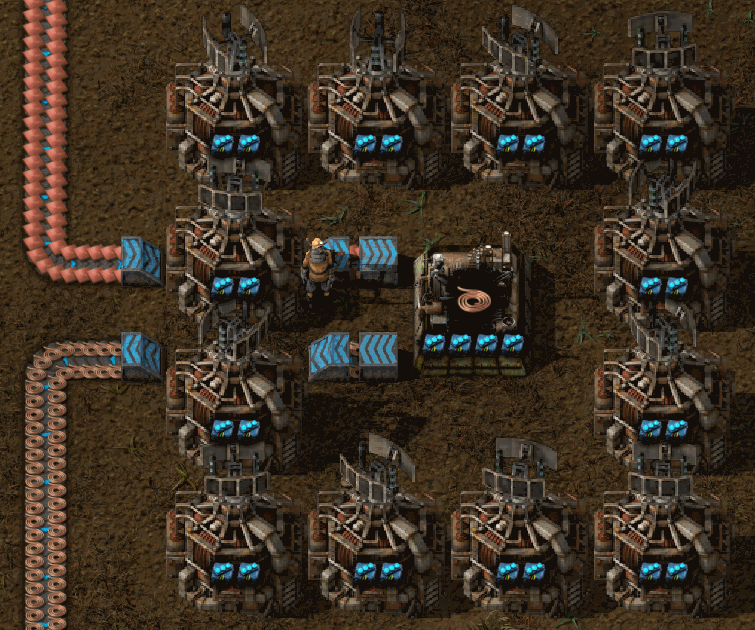 Energy usage of inserters is calculated by the Factorio engine based on theoretical maximum consumption based on the inserter's movement speed. In practice true consumption is limited by throughput, which is limited in this case by belt speed and Factorio's 60 Hz update rate. If you had a belt of infinite speed and could move multiple stacks per tick, these inserters would indeed consume 4.8 MW. In the next version I'll be making the speed of the inserters match the speed of the belt, instead of having them all be super fast no matter the belt speed. So the energy consumption estimate should be more accurate. I really love your mod, thanks for making it. These chests are "normal" steel chests, but "melted" together by the MergeChests mod. The miniloader seems to have some sort of underground belt component (they can actually be used as underground belts apparently). So the iron plates in the example image from the top-station are loaded into the bottom-train. This only happens when there is no train in the top-station, if there is the top-train will be filled. 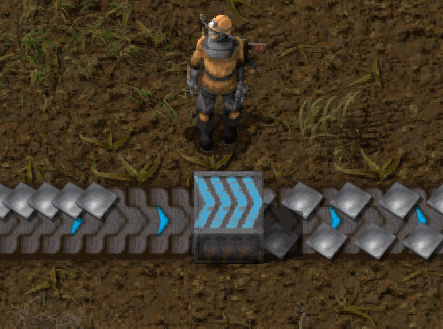 Is there a way to disable this underground belt behaviour? On a minor note, the miniloader seems to graphically disappear in the background, when you use them vertically, like in the screenshot. Oaquasis wrote: The miniloader seems to have some sort of underground belt component (they can actually be used as underground belts apparently). Miniloaders do use an underground belt component; this is how they connect properly to belts. However, they are set to a maximum distance of 0, so they aren't supposed to be able to connect to each other, and in my testing they cannont. Are you using any other mods that adjust underground belt distance? Those mods may be unintentionally affecting miniloaders by indiscriminately changing belt distance for all underground belt entities. Depending on how that other mod is structured I might be able to work around the issue. Oaquasis wrote: On a minor note, the miniloader seems to graphically disappear in the background, when you use them vertically, like in the screenshot. The miniloader graphics stick out of the 32x32 bounding box for tiles quite a bit, and so can clip into adjacent entities. I've been working on changing the graphics to minimize this effect with limited success so far, but it should be improved in the next version. Ah omg, thanks for the fast response. We are using the "Longer Underground Belt (Aligned)" mod. That's the "culprit" apparently, when disabled the problem is solved. I recently tried out your miniloader, and I like the idea of them needing power and also being harder to get. I think the loader redux is a little overpowered in this regard. Asanda_Nima wrote: I recently tried out your miniloader, and I like the idea of them needing power and also being harder to get. I think the loader redux is a little overpowered in this regard. I'm currently working on filters and direct circuit control, which should make miniloaders strictly more flexible than vanilla / Loader Redux loaders. Getting the scripting and graphics to work properly is quite tricky though, since I'm being very careful to minimize the UPS impact. Coming soon! Can you make the scripting stuff optional in some way? Or leave current ones like they are and make second version that will have filtering and circuit and it will use scripts? Currently I need per-tick processing only while the player is holding a circuit wire over an entity. No per-tick processing after circuits etc are configured. If there were events for circuit connectivity changes that wouldn't be necessary, but requests for that functionality haven't gotten any dev attention yet. 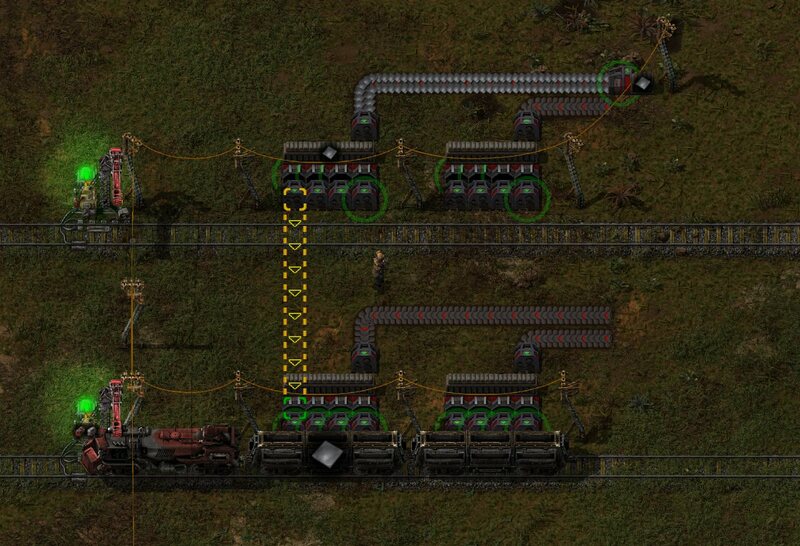 Love miniloaders... use them with warehouses to make train loading/unloading stations. Just started a FactorioExtended game... would be nice if miniloaders support FactorioExtended belts (much like Bob's belts). Major new revision 1.4.0 now available through the mod portal and in-game browser. Miniloaders now support filters and can be controlled via circuit network. Filters need to be enabled via options at startup. 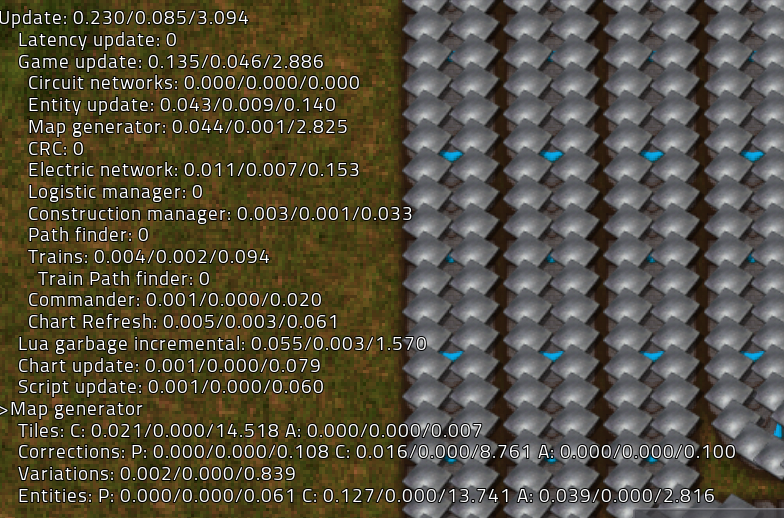 If you enable filters, then like filter inserters, miniloaders will not move any items until filters are configured. This version required a considerable redesign and rewrite, so I expect there are probably bugs. If you need to, version 1.3.0 is still available for manual download through the mod portal. I appreciate your thoughts and bug reports. Happy factory building! It kind of sort of creates a small case of a huge mess by spilling everything on the whole length of the connected belts on the ground. Quick workaround, downgrade mod do 1.3, mark each segment fo the connecting belt for deconstruction ( do not deconstruct, just mark it so it stops moving ), save, update mod, load game, cancel deconstruction mark. staviq wrote: It kind of sort of creates a small case of a huge mess by spilling everything on the whole length of the connected belts on the ground. Wow, that's certainly unexpected. At first glance I'm at a loss to explain how that big a mess could happen during the upgrade. Could you send me a save game and a mod list so I can investigate more closely? Filters are a great idea, but either filtered or not?? Any chance you will make a version that makes two of each miniloader? The existing non filtered miniloader so bases won't break, and put in new entities for the filtered versions so they can start being used without braking an existing game? I went ahead and made me a version that allows both the normal miniloaders and filtered miniloaders, well worth doing. I just used the same graphics for both versions, name difference is enough, don't care that the two types look the same. Hope you make a version that has both types, then I can drop my temp version, I can phase out loaderRedux now. Having the same thing happen, I'm using the mod CollectDroppedItemsHotkey to clean up, still have to run around and clear unwanted items from belts that are contaminating belt feeds into entities. Does it still have bugs or can i safely install it? Im really looking for a loader with filter abilitys. Does it also insert wrong material in trains like real filter inserters?